Six Online Safety Tips for Kids and Parents. For most kids summer vacation is fast approaching, so now is a great time to talk about online safety with them. More time at home means more time on the computer for many, and whether or not you’ve had a talk about online safety with them before, it’s never a bad thing to cover the ground rules of staying safe on the Internet. Every household is different with regard to what is acceptable to view online and what isn’t. Be sure to let your kids know what the rules are so they can make good decisions. Online safety starts at home with a talk. Every generation has their own slang. You had it, I had it, your kids have it and there’s definitely a new way of talking when it comes to texting on cell phones or chatting on the Internet. Go to places like Urban Dictionary or our blog post on common cell phone & texting acronyms if you see something you don’t get, daddy-o. Can ya dig it? There’s your first 2 definitions: F2F means Face to Face and IRL means In Real Life. If talking with strangers online is bad, setting up a meeting with them is even worse! Be clear with your kids: no one will be arranging to meet anyone, child or adult, who they don’t know already. Classmates, neighborhood friends, Cousin Tommy from Portland… they’re probably OK. But not UltraSuperHotGirl1954 (any similarities with a real username is purely coincidental & unintended) from that one website, who is probably a 56 year old dude looking for trouble. It’s summer time and the livin’s easy! Encourage your kids to step away from the computer and work on a real tan outside (with sunscreen, of course) instead of a monitor tan inside. Get them involved in a summer sport, take them hiking, or just get them out mowing the lawn. Whatever it is they do outside, fresh air = good and all day on the computer = bad. Don’t be afraid to get up in their business. It’s your responsibility to make sure that they’re not getting themselves into trouble. (Whether they know it or not) Keeping tabs on who they’re talking to and what they’re up to isn’t snooping, it’s good parenting and an integral part of your kids online safety. 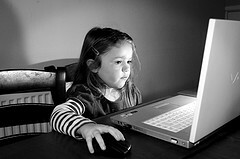 So much of your kids online safety is in their hands every time they type. Where they live, their email address, the name of their school: these are all things an online predator can use against them. Teach them that any personally identifiable information is an online safety no-no. Having a fun, safe summer is easy; it just takes a little nudge in the right direction from a loving hand. Enjoy your summer! I respect the fact that you are helping to education parents about resources available to protect children online. Personally I believe that there is such a gap between parents and children, especially in this internet revolution. Many parents are not savvy to what actually happens on the internet. It is hard to find a reliable source of security. There needs to be a new wave of programs that are of easier access for parents who may not know how to use a computer.